1. We can all agree on three things in regards to Gus Bradley: (1) Everybody likes him, (2) Sometime in the near future he’s going to be relieved of his duties as Jaguars head coach, and (3) Gus is a truly underrated first name. If this country had more people named Gus—both genders—maybe we wouldn’t have so many problems. Think about it. I’d hope that Bradley gets another shot at a head-coaching job some time in the next half decade. While no fan base is excited by a retread hire, here’s a list of current retreads and how they’re doing. Then: Fired after five seasons with Browns (36-44). Now: Wears hoodie (sometimes). Four-time Super Bowl champion. Then: Fired after six seasons with Jets (46-50). Now: 14-14 after season-plus in Buffalo (despite subpar roster). Then: Fired after one season with Raiders (8-8). Now: Winless with D-League Browns roster, but was considered the hottest coach on the market last winter. Then: Fired after two seasons with Bills (14-18), one season with Jaguars (2-14). Now: Purveyor of exotic smashmouth, 6-6 Titans are tied for first in AFC South one season after posting football’s worst record. Then: Fired after 14 seasons with Eagles (130-93), replaced by can’t miss collegiate hire Chip Kelly. Now: Took over 2-14 Chiefs trainwreck in 2013, 61-41 with third playoff appearance in four years upcoming, potential No. 1 seed in the AFC. Then: Fired after nine seasons with Jaguars (68-71). Now: Took over 3-13 Raiders team in 2015, 17-12 in two seasons in Oakland, in the midst of Raiders’ first 10-win season since 2002. Then: Fired after eight seasons with Texans (61-64). Now: 20-8 in two seasons with Denver, Super Bowl 50 champion. Then: Fired after three seasons with Colts (26-12). Now: 26-18 over two-plus seasons in Detroit, Lions hold two-game lead in NFC North. Then: Fired after nine seasons with Panthers (73-71), four seasons with Broncos (46-18). Now: Meh, not so good. Then: Fired after one season with Jets (6-10), three seasons with Patriots (27-21). Now: 108-68 over seven seasons with Seattle, Super Bowl XLVIII champion, two-time NFC champion. Then: Fired after 17 seasons with Titans (142-120). Now: Things could be better. Then: Fired after three seasons with Eagles (26-21). Now: Well, it is a massive rebuild. Just keep him away from the draft. And free agency. That’s a pretty good group of coaches. And notice the success of the two former Jaguars guys (Del Rio and Mularkey). And the track record of the defensive coaches (Belichick, Carroll and Del Rio especially, but also Fox’s time in Denver, and Rex deserves credit—yes, credit—for pulling out .500 records with this Bills roster). Bradley will go be a good defensive coach for someone in 2017. He’s 50, but he’s a young 50, aging like Jack Lalanne. Or Pete Carroll. There’s more to hiring a head coach than breaking out a spreadsheet (like I just did! ), but Bradley surely learned some lessons he can put into making it work the next time around. Anyway, 0-16 is a bad look in an interview room. But 20… oh… and-16 (like the year, get it?) 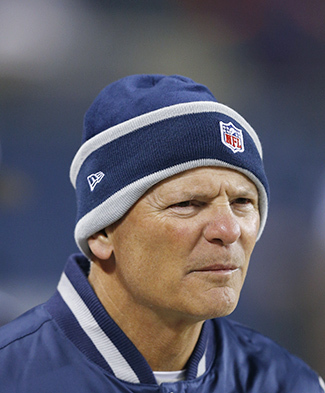 has been very good to Marinelli. I’m sure he’s not rooting for the Browns to go winless, because that’s not the type of guy he is, but for his legacy’s sake it would be nice to have company. As for Marinelli’s current job, it’s that time of year to point out how good the Cowboys defense has been relative to the talent on that side of the ball. In part because we’ve exhausted everything we could write about the offense, but also because the defense has been surprisingly competent. When you’re a unit that lacks any singular pass-rushing presence or any true ball-hawking type in the secondary, it’s not easy to be good week in and week out. The Cowboys have only forced 11 turnovers (only the Jaguars, Bears and Jets have forced fewer). They don’t get a lot of sacks (23, coming on about 4.6% of opponent dropbacks, fourth-lowest rate in the league) or force many holding calls (576 enforced penalty yards by opposing offenses, 31st in the NFL). What Marinelli has them doing is playing very fast, especially the linebackers and secondary, and very disciplined. They don’t give up huge plays (two TDs of 20-plus yards allowed, tied with Detroit for fewest in the league). They’ve committed only 48 yards worth of defensive pass interference penalties, fourth-fewest in the league. They typically bend but don’t break, allowing 5.11 points per possession in goal-to-go situations, tied for sixth-fewest in the league. That’s all a product of good coaching. And it’s how a unit with middling-at-best talent sits fifth in the league in scoring defense. 3a. One more thing on the Cowboys and the MVP race, because... I’m… just a click-bait whore. In actuality, with Derek Carr gracefully bowing out of the race on Thursday night, it’s a two-man competition for MVP barring madness engulfing the world over the final four weeks. You can discount the early-season suspension and give it to Tom Brady, who has been the best player in football since Week 5. If that’s a hangup for you, you can cast your vote for Matthew Stafford, who has stood on his head to keep the Lions offense moving (or, at least moving when they need points in the fourth quarter) despite a rash of injuries to an already subpar collection of weapons. There will be those who think that the MVP must come from Dallas because Dallas will, in all likelihood, finish with the NFL’s best record. Dak Prescott is not the MVP seeing as you could argue he is no better than the sixth best player on his own unit (and you would win that argument). Ezkiel Elliott probably shouldn’t win it because a running back has to have a transcendent season to win MVP, and while Elliott is great he’s probably not the best running back in football this season. In a desperate attempt to satiate the god of internet clicks, the argument has turned to, “Let’s give it to the offensive line as a unit.” Which makes no sense—literally no sense—because that unit is made up of five different players, each with different bodies and minds and souls and fears and dreams and moms. “Broncos defensive line” wasn’t MVP of Super Bowl 50, Von Miller was, because one is a singular player, and one is a group of players, and the award is meant to recognize outstanding individual performance. There are win-loss records and Lombardi Trophies awarded for team excellence. So let’s stop being so frickin’ lazy and separate the candidacies of the five different human beings who play on that Cowboys offensive line, and then pinpoint a candidate most deserving of the Most Valuable Player (singular) award. We can rule out right tackle Doug Free, who’s a decent but wildly inconsistent right tackle and quite clearly the weakest link on a historically great line. We can rule out left guard Ronald Leary because he’s a good-not-great talent who was on the bench for the season’s first three games. The only reason not to vote Brady would be if you have a problem with him missing four games, so by that logic let’s rule out Tyron Smith, who missed two games due to injury. That leaves us with right guard Zack Martin, one of the best guards in the league, and center Travis Frederick, indisputably the best center in football. Personally, I’d give Frederick the edge. As a center he’s the leader of the unit, and more than anything else his reach blocks fuel the best running game in football. My understanding is that he is also responsible for setting protections for his rookie quarterback (while Prescott confirms them). And it just so happens that Frederick, on Sunday night, will have a chance to avenge his worst performance of the 2016 season (very much relative, because it was still a good performance for just about any other center). Frederick will have to deal with Damon Harrison in East Rutherford, and the two pretty much battled to a draw in Week 1, a big reason why the Cowboys couldn’t get anything going consistently on the ground. 3b. By “you” in the above section, I mean someone with an actual MVP vote. Because I don’t have a vote. Because nobody listens to me. Because nobody loves me. 4. A story from my childhood: My oldest brother had a paper route in high school, requiring him to get up and out the door around 5 a.m. to deliver the Saturday morning edition of the Journal Enquirer while the rest of the world slept and waited. I watched that test pattern for a good 40 minutes before Barney Bear—a protagonist with anger management issues, a sleep disorder and, looking back, probably an Oxycontin addiction—got underway, surely an episode having to do with a small, loud woodland creature and/or malfunctioning alarm clock. (Man, did alarm clocks malfunction back then.) And around 9:30 this past Monday night, I found myself yearning for that test pattern. Because, for the sixth time this season, we had a Monday Night Football game that was not fit for human consumption. I know the NFL likes jerking ESPN around a little bit, but while having a bad slate of games is no good for ESPN, it’s also bad for the NFL. One big reason people are watching less football is because the most prominent games, the ones on in primetime, are consistently bad. Thursday Night Football is, has been and will be pure garbage due to the 100-hour turnaround for teams (just get rid of two preseason weeks and build in extra bye weeks before TNF!). On Sunday nights, you’re asking many people who just watched seven hours of football to settle in for three more. Monday night football could be built back into a behemoth. You just have to put good games there. And if the games are going to be worse than the Sunday nighter and the national 4:00 game, that’s fine. But give ESPN flex scheduling. Last week could have been, say, Chiefs-Falcons, or Packers-Texans. Something above the baseline of better than a test pattern, and something to break the narrative that these primetime games are largely unwatchable trash. Like Colts-Jets. 5a. If, on Sunday, you tweeted something along the lines of, “OMG jered goffs pocket presents is so bad #twitter #blessed” I have an exercise for you. It requires two people, so get a friend or family member to stand next to you as you compose a tweet. After you’ve entered the first four or five characters of your Twitter message, have your friend punch you in the face as hard as he or she can, then mock you for not being able to assemble your witty missive. Then, my friend, you will have walked a mile in Jared Goff’s shoes. This was the reason the Rams were right to be hesitant to plug Goff into the lineup. I had heard rumors that a Rams offensive lineman had been spotted blocking someone. But the footage was very grainy, and I’m pretty sure it was just a guy in a bear suit. But basically, Goff receives the snap and is immediately engulfed in pass rushers. It’s the kind of thing that can ruin a young QB. The one good thing about Goff is that he got this treatment as a freshman at Cal, so maybe it won’t break him. Though it seems the Rams aren’t really concerned one way or another, what with the new stadium being built and all. 5b. If you want to get a peek at an almost comical level of dysfunction within an NFL franchise, read Albert Breer’s column from this week. 5c. So I made this my bold prediction on the Look Ahead Podcast, but man, with everything circling around the Rams right now, isn’t this Falcons visit exactly the kind of game that Jeff Fisher’s teams usually win? 6. I moved up The MMQB Read of the Week up a few spots because it sets up the next couple items. But, as you might have seen, it was Green Bay Week at The MMQB, and we’re mighty proud of the Travel + Leisure wannabe work we did. My personal favorites: Emily Kaplan goes with rookie Trevor Davis to buy his first coat, Robert Klemko on how Reggie White made Green Bay a free-agent destination, and Kalyn Kahler on team chaplain Father Jim and a long-form Q&A with retired Pro Bowl RB, self-proclaimed “half-jock, half-nerd” Ahman Green. 7. We’ve bounced this story idea around at The MMQB, and it came up a little bit in that aforementioned Ahman Green Q&A: Madden as an eSport. A little background if you have no idea what an eSport is: Basically, video games as a competitive, spectator sport (the “e” is for “electronic”). If you want to learn more, I suggest looking at the internet. I think, to a person, the first time anyone hears that watching other people play video games is a thing, they think it’s silly. I did at first. But I have been trying to get into eSports for two reasons: (1) It has a huge, passionate following, and (a) that many people can’t be wrong, and (b) as my mom once told me when I was in high school, I’m not popular enough to be different. (I wouldn’t call myself an eSports “fan” yet, but I’ll get there.) And (2) I’m not young, but I’m also not old, and I’m trying to make it some 30 more years in this sports journalism industry, and eSports are probably going to be a big part of the next three decades. Madden is a simulation of professional football. And you can already watch professional football. A lot of people do! Remember Madden Nation, that abomination that used to air on ESPN2 at 2 a.m.? There’s a reason that was formatted like an off-brand Mark Burnett production rather than one that showed actual games: Watching competitive football is already a thing, so there’s little demand for watching a video-game version of football. Madden is an incredible simulation of the real thing, and it’s a whole lot of fun to play, but to promote an electronic version of a spectator sport as a spectator sport is more than a bit silly. 8. The best thing I learned working on Green Bay Week actually came while doing photo research (for Emily Kaplan’s piece on Ron Wolf’s impact on draft strategy, which technically was not Green Bay Week, but close enough). It’s Jim McMahon! Wearing his Bears jersey! At the Packers’ Super Bowl XXXI White House celebration! 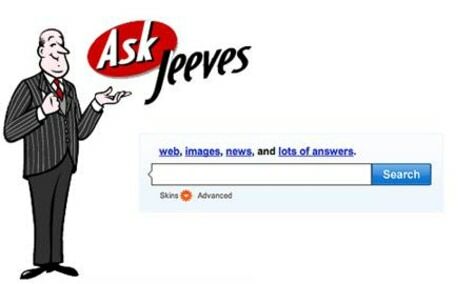 I asked my friend Jeeves about it*, and turns out there’s a good backstory. The ’85 Bears never made it to the White House; in the aftermath of the Challenger disaster, they never got an invite. A little more than a decade later, McMahon was Favre’s backup in Super Bowl XXXI (I recall my friend Murph saying**: “I hope they have to put him in, and he reveals that he didn’t bring his helmet to New Orleans and instead puts on a brightly colored jester hat and tells Mike Holmgren, “I just came for the local color.”) And the Bears jersey was his way of bringing that ’85 team to the White House. Anyway, strong move by the Punky QB. 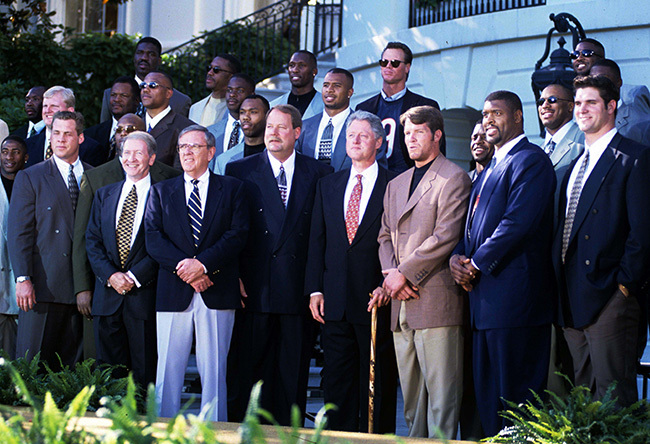 And the ’85 Bears did make a White House trip in 2011, which, chronologically, came after 1997. *—Recycled joke! Sorry, I like that one. Both Andy Benoit and my wife have laughed at it. You’ll probably see it again. **—It’s just like a Bill Simmons column! 9a. While the world was focused on The MMQB’s Green Bay Week, many of you seemed to miss out on my shadow convention: Hartford Week. An actual thing I own. And you KNOW it's a good shirt, because the sleeves are cut off. And goodness, did you miss out. Hartford Week started out with a visit to the downtown site that was supposed to house the New England Patriots beginning in 2001. 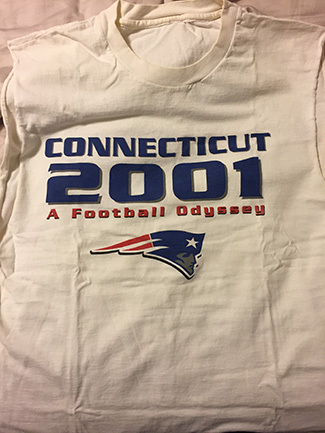 What ever happened to the Patriots after they were unable to move to Hartford? Some say their rickety old stadium imploded mid-game and the ghosts of their players and staffers still haunt the streets of Foxborough to this day. Others say the team built a new stadium in Foxborough and nobody died and they won four Super Bowls. We may never know the truth. That was followed by a trip to New Haven to see the courthouse where John Rowland, the governor who negotiated a publicly financed stadium with Robert Kraft in the late-90s, was convicted on corruption charges***. After that, it was a visit to the New Britain Arby’s where Tebucky Jones (might have) ate five roast beef sandwiches for $5.95. And finally, Hartford Week concluded with a Tweetup at the I-84 commuter lot off Exit 68 in Tolland, where I enjoyed a six-pack of Royal Crown Cola, the only soft drink to cool you off on a late-autumn New England evening. Positively soul-quenching. And I’m glad to say I did have one person join me for the Tweetup, a fellow I met through Craigslist after I agreed to purchase a six-foot ladder with three missing rungs and extensive termite damage. He wasn’t much of a football fan and didn’t stick around to chat or tell me his name, but I’m pretty sure it was a thrill for him to meet me. Also, I couldn’t fit the ladder into my Pontiac Aztec, so good news for you smart holiday shoppers: For sale, ladder, missing only three rungs but otherwise in pristine condition aside from termite damage. $4 or best offer. Pickup-only behind the dumpster of the Dunkin’ Donuts next to the commuter lot off Exit 68 of I-84 in Tolland. ***—This was 2004, and I distinctly remember Rowland and his wife tried the “blame the media” route. (When will people learn: Politicians must wield unchecked power for the system to work. After all, what would he possibly have to gain by lying?) Anyway, I moved to New York a year after all that went down, then moved back to Connecticut five years later, in plenty of time to see Rowland head back to prison after being convicted on various counts including conspiracy and falsifying records in a federal inquiry, as part of a campaign fee scandal. So, way to go, lamestream media. 9b. Just to be clear: I honestly do love Connecticut. I grew up here, five years ago moved back here and I plan to die here because it’s a wonderful place to be even if the taxes are on the high side and the state is short on corporate welfare (so, sorry Rick Scott).